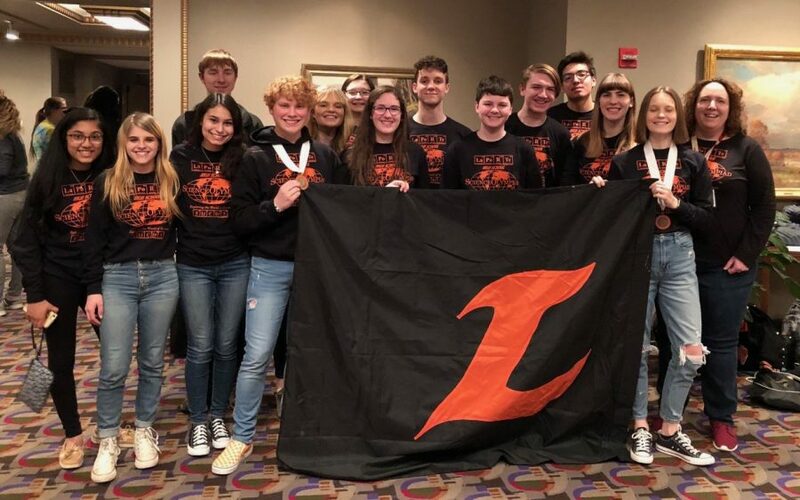 The LaPorte High School 2019 Science Olympiad Team attended the State competition in Bloomington on March 16th. Science Olympiad is a team competition testing students’ knowledge of science topics and also design and building skills. Team members are in groups of two or three for over 24 events, competing against other schools. Students prepared for their events for months ahead of time and then on the day of competition, either answer questions about a topic or compete in a build event. “Being LPHS first time going to State, it was an amazing experience. We had a lot of fun spending the weekend together and working as a team. We also learned a lot that we will use to help Science Olympiad be even more successful in the future,” Alexis Ochoa, junior, said. At state, juniors, Jaden Millard and Haley Joseph won a 3rd place medal in herpetology, and other teams that scored fairly high for the first time going to state. “I felt absolutely shocked. I had no clue that I was going to place, and when it happened, I was amazed. It could possibly be one of the greatest moments in my life,” Millard said. Students spent a lot of time studying, putting together materials, and building projects. The competition, just like science, isn’t a result of one person’s work but a collaboration of the entire team working together to accomplish a goal. “Competing at State for me was a chance to see students that are passionate about science apply that passion, knowledge, and skills during competition. It was also exciting to see so many teenagers, parents, and teachers from all over the state excited about science. Science unlocks the mysteries of our world and helps us advance and improve our lives. It was inspiring to see young people that will continue this pursuit,” Owens said.